Reliability – rating Apps rely on personal opinion and finding Apps need to be regularly updated. Accessibility of the App or website for people with impairments can often be neglected. Not all toilets are listed on all sites – so you may have to look through several to get a better picture. There may be more than one toilet at a venue and it may not be clear exactly where the accessible ones are (or which one was reviewed if more than one). Here are a few worth looking at – each had its own merits so tell us what you think (and let the website/App developers know so they can hopefully make them better suit your needs). They are all free at the time of listing. I thought this App had great potential and the developers responded positively to feedback. This is both a rating and finding App. You can rate virtually every toilet feature including access features and cleanliness. Changing Place toilets are included as a review type – and a photo can be submitted for elements you wish to highlight. Reviews are personal reflections which is something to consider but with enough contributors and a date the reviewer visited that facility, this could become a leading database to look at. You do not have to enter your e-mail to go into the App. A web version also exists with enhanced features. 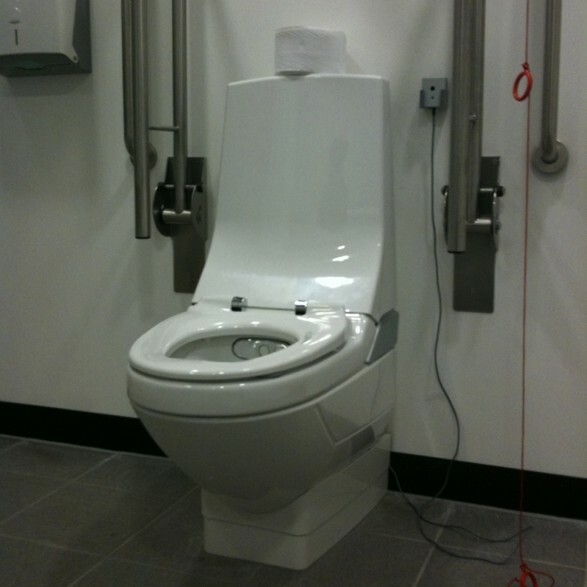 This is a toilet finding App for Changing Places toilets which have a hoist and changing bench. The title is somewhat misleading as this is not the Changing Places Consortium map. Here are some screen shots. The inclusion of data such as whether you need to pay, need a NKS (RADAR) key or if locked is very helpful. A quick test did not reveal all the sites registered on the CP Consortium map – but it did list toilets that didn’t meet the full CP criteria which was useful. You can let them know if a toilet is missing. Ours was the very first one, has 200 more toilets than the British Toilet Association have on theirs, more accurately described and with a more intuitive design of programme. A similar free website for accessible toilets will follow, so the 5 year old sheets from Disability Rights UK will then be able to be binned. Next is map that is perhaps the most familiar to hoist and bench users. The one function I’d really like to see developed is to search by venue type eg to search for ‘zoo’ or ‘restaurant’ rather than just by location. I’d also like a map somewhere of hoist assisted toilets for people who don’t need a bench or perhaps more info on equipment eg if a toilet riser or bidet is provided. Speaking of bidets, Closomat have a map where you will find their toilets – also useful if you want to try one out. Lastly this website seems to have lost its place (and funding). You can enter toilet data in a basic format but to be honest, it’s pretty poor. As you can see it never found any toilets near me. and Disabled Go (lots of information but not every toilet at a venue is described).